I've wondered, what makes a collection of weapons a cache of weapons? According to the above definition, it must be hidden, secured, or something hidden or stored in a hidden or secure place. It seems, to the Main Stream News Media, a cache of weapons is a great headline and two or more weapons. My goodness, I must have an arsenal then. On to the news. Harding Township stabbing leads police to weapons cache. With consent, the police searched the home and discovered numerous knives in the kitchen and seized them all. Actually no, that would have been silly, police seized 15 handguns and five rifles. The suspect has shown no qualms about stabbing someone, so they leave the knives and take the guns. A Northern California teen charged in a drive-by shooting and the theft of a celebrity chef's Lamborghini kept an arsenal that included assault rifles, cellphone-jamming equipment and police gear, authorities said. An ARSENAL? I wonder how many weapons make up an arsenal. The teen from tony Marin County inadvertently led investigators to the storage facility in Richmond, where they found the two assault rifles and shotgun shells, a San Francisco Police Department uniform and badge and false identification cards for California, Florida and New York, according to court documents obtained by the Marin Independent Journal. (Following a traffic stop) Two men were found with a cache of weapons and $8,400 cash, telling police that they were headed to Warrington Middle School Thursday morning to tutor students. Oh, my a cache of weapons in a car. I wonder how many. Police located and seized parts for the assembly of up to 20 AR-15 assault rifles. They also located five handguns, including a Colt 45 revolver, a Smith and Wesson revolver and a semi-automatic pistol; and a sawn-off, fully-automatic .22 calibre rifle. 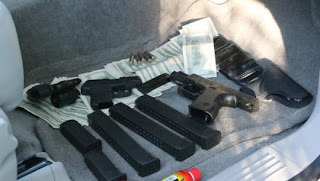 (during a search warrant execution at a related property) At this property, detectives seized a semi-automatic pistol, additional parts for AR-15 assault rifles and approximately 20,000 bullets and casings. All kidding aside, these are some very serious charges. All of this happened in New South Wales, Australia, where these things are against the law. The government on an Island, a piece of land surrounded by water, with no open borders still can't stop criminals from getting guns. And what happens when you make something illegal? You make rich criminals. Investigations are underway to determine if the firearms were being prepared for supply to criminals throughout NSW. An AR-15 assault rifle can fetch more than $25,000 on the black market. $25,000 for a $1,000 weapon. I still haven't read or heard about a weapons cache containing only knives. I guess a knife cache doesn't bring in the readers. Actually, I bet it would.